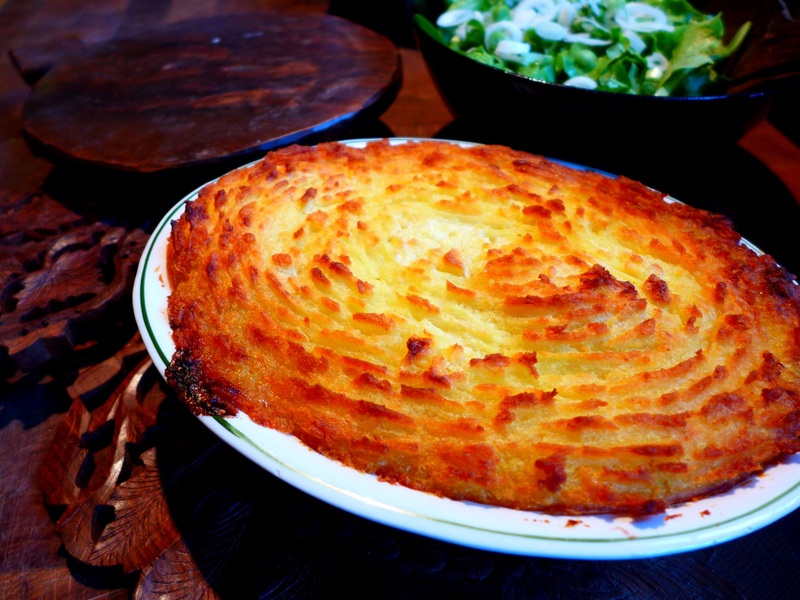 I realise I may be trampling over cherished childhood memories here, but I find English cottage pie quite boring, no matter how well it is made. This Anglo-Indian mash-up is another kettle of fish entirely. It’s perfect for a rainy night any time of the year. 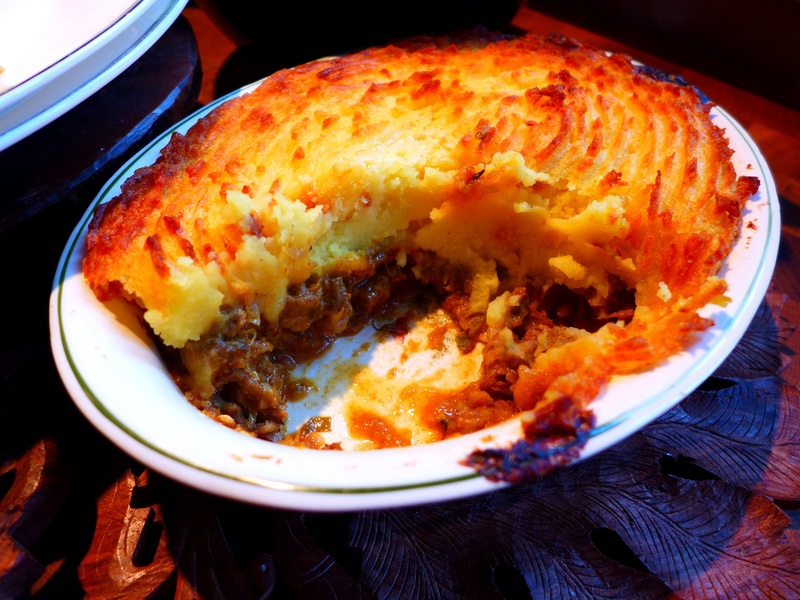 I used very rare chopped beef from the weekend roast but good-quality steak mince would work too, or lamb if you want to make it into a spicy shepherd’s pie, in which case you can add a teaspoon of ground fennel seeds with the spices. Please don’t be put off by the long list of ingredients – it’s all storecupboard stuff and there are no fiddly pastes to make. I think the filling is best made the day before but if you’re in a hurry it’s not essential. Heat the oil in a deep frying pan and fry the onions until golden brown, stirring occasionally. Add the cloves, cardamoms, bay leaves and mace and fry for a minute. Now add the garlic and ginger and remaining spices with a splash of water and cook for a couple of minutes more, stirring. Add the meat and sauté for five minutes. On a low heat, add the yoghurt and continue to cook for a couple of minutes before pouring in the water and stirring well to mix. Bring to a boil, reduce to a steady simmer and cook for about 20 minutes until the sauce has reduced and the flavours have blended. Check the seasoning, fish out the bay leaves and the larger spices if you can find them and spoon the filling into a pie dish. If you’re making this ahead, you can refrigerate it overnight, covered, once it has cooled. 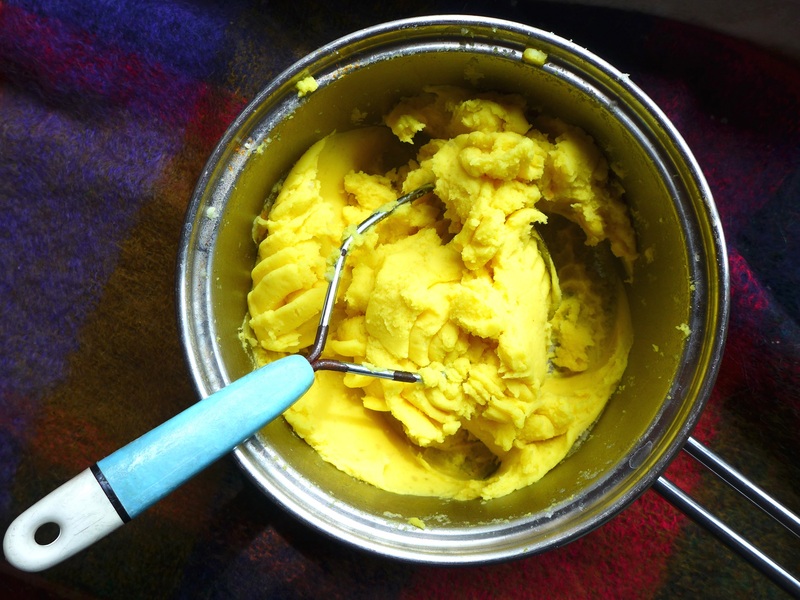 To finish, top with the turmeric mash, rough up with a fork and dot with butter. Cook in the oven for about 20-30 minutes or until the filling is hot and the topping nicely browned. Try it with a green salad or an Indian veggie dish of your choice. A fruity, spicy relish is good on the side. I liked it with The Bhajiman’s Date and Lime Chutney (disclaimer: Don is a friend of mine and the chutney was a gift). 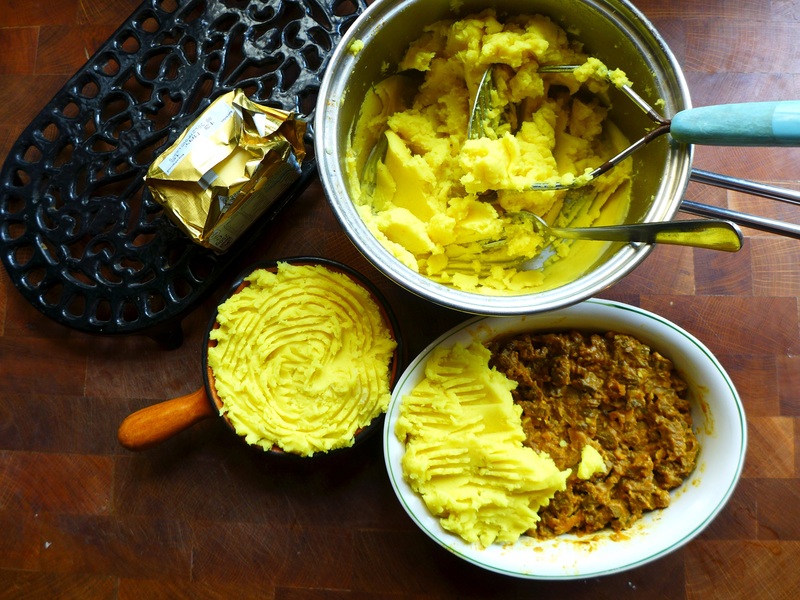 This entry was posted in Beef, Lamb and kid, Mains and tagged curried cottage pie, leftovers recipes, Rogan Josh Cottage Pie, Rogan Josh Shepherd's Pie by Linda Duffin. Bookmark the permalink. W-h-a-t ??? Oh go on then. It sounds rather good.